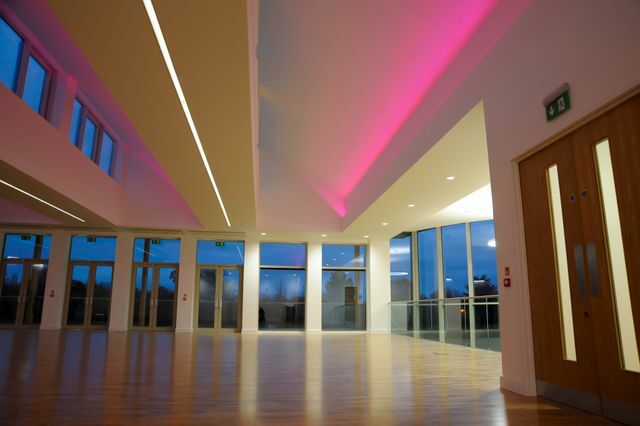 We really enjoyed the challenge of assisting with the lighting design on a project which had a number of different requirements and varied use's depending on when and by whom the building was being used. We feel the lighting for the project was a great mix of the high aesthetic requirements of the client to create a vibrant and modern environment while being conscious of the budgetary constraints for the project. It required a dynamic lighting scheme which took account of the architecture and the multi-use nature of the pavilion and became a prominent feature in key areas of the building. Summer Fields School Oxford features in Architects Journal http://tinyurl.com/zh7bwrd Corstorphine + Wright has unveiled this sports pavilion at Summer Fields boys’ school in Oxford The two-storey 1,145m2 pavilion includes changing, storage and laundry facilities on the ground floor alongside flexible teaching and events spaces on the upper floor. The scheme creates a new gateway to the school linking together its existing sports hall and swimming pool.